Life in space is harsh and unforgiving. The recycling systems for space stations, now many hundreds of cycles old, were never 100% efficient. There is always some small bit of loss, of things essential for sustaining human life. Foremost of these is water. Read on to learn more about how one station serves the star systems as the provider of this most crucial of resources. 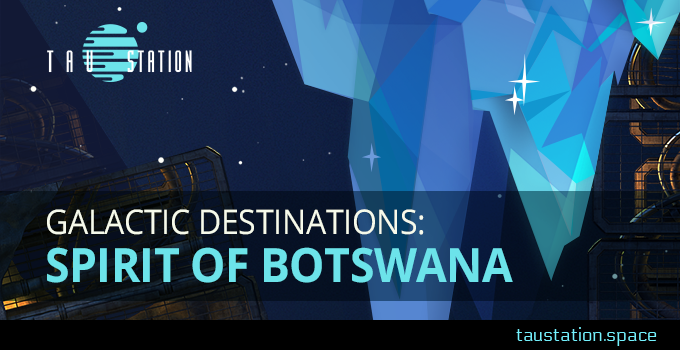 Hundreds of years ago, the discovery of a diamond mine on Earth, in the country of Botswana, took the small country from near poverty to rapid growth and economic stability. In order to diversify, the government next poured resources into mining of a different sort. They became one of the premier innovators and forerunners of mining ice, in space. Eventually, the massive Spirit of Botswana station was built. It quickly became the galaxy’s largest water purification plant, and was the home base for ice mining operations across the star systems. The once-landlocked country was now entirely focused on water, and they carried their innovations into the far corners of space, stretching out and providing water for the majority of the stations in the Sol and Alpha Centauri A systems. This golden era of plenty was not to last, however. During the Catastrophe, most of the station’s air was vented into space, killing nearly everyone aboard. When the mechanic operating the enormous mechanical arms that secure ships and their towed cargo suffocated, a huge hauler, with an enormous chunk of ice in tow, was sent plummeting into the station. The hauler exploded as it crashed, and the damage from the detonation, as well as the collision of the ice with the station, turned the shipping bay and surrounding decks into slags of molten metal and caused enormous craters in the station. The blast also blew apart sections of the residential and downtown metropolitan areas of the station. Nearly all on board Spirit of Botswana were killed. In fact, very few on Spirit of Botswana survived the Catastrophe that day, but some did, both station-side and those who were returning from mining expeditions. Together, they went on to rebuild and make the galaxy’s most important station operational once more. It took many cycles, but the water processing plants are finally back online. Starships once again make the loop out to Saturn, through the jump gate and back. The massive shipping bay has been repaired, though the scars of destruction can still be seen. Today, the Aquatic Resources Corp manages the mining operations, providing jobs to those brave enough to risk life and limb out among the ice and stars. These brave souls hold the fate of the star systems in their hands; their precious cargo essential for life in space to continue.